Our first visit is to a house that has a signboard outside the main gate -parched on a hedge of dried coconut leaf. It reads, "Reshmi Tailors". Reshmi, I later learn, is the 5 year old daughter of Mureen Renuka - owner of the house and leader of a team of tailors. Inside the house, in one of the 3 rooms, there are 6 sewing machines. Working with those sewing machines are 8 women. Behind them, hanging on the wall, are a number of pieces they stitched: frocks, tunics, trousers. The machines - each costing about 30,000 Lankan rupee - were given by the Dugong conservation team. Nilmini, a member of the tailoring collective is busy at work. There are 400 fishermen in Serakkulia. While everyone is trying stopped using the banned nets, 10 have so far gone public, pledging their support to the conservation team to help save the Dugong. This means not only using the legal fishing methods but also avoiding fishing in areas that are likely to have any endangered species and also informing the authorities if they spot any illegal activities by others. Typically, in a fisherman community, the man catches the fish while the woman cleans, guts, dry and sometimes help sell in the local market. In Serakkulia most of the catch is loaded in a truck and sold in bigger markets of Puttalam and Colombo, so a woman's job entails mending the nets and other household chores. So, at Reshmi Tailors, women are getting their first shot at turning entrepreneurs and earning some money of their own. Renuka tells me. "There are 8 of us right now working here full time. We take orders to stitch dresses. But we also train others in tailoring," she says. At present she earns about 25-28,000 Sri Lankan rupee ($160-$180) from tailoring. Of that, 18,000 is spent on three of her children's school fees alone. Also, as a non-farming community, they buy all their foods - oi, rice, meat, spices, fruits etc- from the market. Mureen Renuka (left) with her fisherman husband who has given up illegal fishing and Rinjhani -a relative. Both Renuka and Rinjhani now are part of a women's tailoring collective. So, what is the cost of adopting sustainable fishing? Sirimal Santha - Renuka's husband says that his income has been halved. Would he consider returning to illegal fishing again? No way, he says, "the risk is too high - if I get caught, I will lose my nets and also my boat for sure." But above all, Santha says that his wife would never allow him to turn back on his pledge. "She is working very hard and I don't want to hurt her (by returning to illegal fishing). We are happy," he says. All the other women tailors - Nilmini, Upaka, Ranjani, Tamali - say that their husbands feel the same way. Later, I meet Niluka Damayanthi and her husband Pradip Prasanna of the same village who are untangling a net in their backyard. 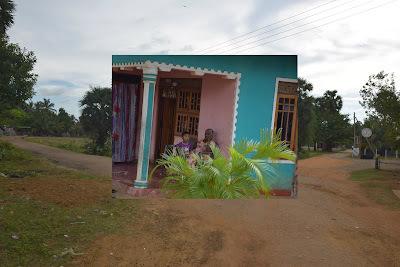 I ask Damayanthi if she has joined the tailoring cooperative yet. "I joined it 3 months ago and also learnt to stitch. But there is not enough work. So I stopped going there," she says. So this seems to be the biggest challenge for this alternative livelihood project: low volume of orders. Dhamshika Maharana, a local marine conservationist agrees. But he also tells me that the women here are in talks with World Vision for marketing their products to a bigger clientele. Once this deal comes through, they will take orders from the big cities and earn much more, he says. Finally, I notice that the number of the converted fishermen is too small. But Arjan Rajasurya, local Project Manager at IUCN - tells me that they have just begun to work with the fishermen and for a beginning, the number is quite encouraging. "We wanted to see if incentivizing women would work. Now, we have got an inroad to get into the local community. For us, that's important. We can now replicate this model in other places"
As I get to leave the village, I think that across the world, big and exotic wildlife species are always targeted by illegal hunters and traders. Different countries are adopting different strategies to tackle that: employing former poachers as forest guards, giving more sophisticated weapons to the guards, tagging animals with GPS trackers and many more. Upaka - a fisherman's wife, is working full time at the tailoring collective. She hopes that soon they will get more orders from the cities. Now here in Sri Lanka, to save the endangered marine creatures, they are investing into women - a strategy that is simple and actually working. Could it not work elsewhere?